An ancient power long kept dormant stirs in the shadows once more as one boy embarks on a quest to earn his freedom and the freedom of his world! Magic has turned to myth, the Vaelhyreans of old to legend, and the power wielded by the ancients has long been forgotten. However, with Ealdred, a mere half-breed slave boy, myth becomes real, the forgotten remembered, and the power of legend is reborn within him. Ealdred is merged into a world of mystery, brimming with deceit, where the remaining Vaelhyreans are in a desperate fight for their very survival. When Ealdred is kidnapped by the power-mongering dark lord Zeldek himself, he must make a choice; to commit his newfound magic to Zeldek’s service or die. But when he meets Bellator, clever yet treacherous servant of Zeldek, an alternative is presented to him: to escape from Zeldek’s stronghold and embark on a quest to find a cursed arrow and free the Vaelhyreans from the spell that keeps their powers at bay. Yet how can he survive in a world where magic is illegal, half-breeds are hated, and the four countries are on the brink of war? Suddenly, a smaller dark figure drops lightly onto the balcony, stooping quickly to its hands and knees. It stays that way for a moment, and then rises slowly and silently to its feet. Even though the figure is blurred by the glass in the door, I know who it is. Bellator pushes the doors softly open, and tiptoes into the room. Her helmet is on her head now, and she is fully armed with her bow and a quiver of arrows at one side, a belt of daggers around her waist, and a sword at her other side. “Fyra?” I repeat, casting a nervous glance into the sky. I slide my knife into my belt, not feeling very encouraged. But I keep my hand close to the hilt in case she tries anything. Bellator goes back to the balcony and steps up onto the parapet, spreading out her arms to both sides like a bird in flight. Glancing over her shoulder, she beckons for me to follow. I approach warily and look up at the sky. The dark shape of her dragon is nowhere in sight. “Follow me!” she cries, and dives over the edge. My stomach drops with her, and a shocked cry escapes my throat. I throw myself to the railing and look down. Her body is plummeting toward the sharp rocks at the foot of the tower, stretched out like a leaf in the wind. I expect at any second to see her crash into the cliff side, and fall forever into the depths below. But then a black form almost too swift for the eye to behold shoots past me and is beneath her in an instant. It opens its wings, stopping itself mid-dive, and she lands on its back, unharmed. 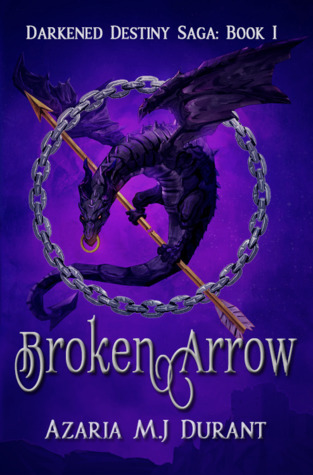 She leans forward, resting a hand on the beast’s head, and they sweep around as smoothly as if Bellator were just another extension of the dragon’s body. “Your turn!” she calls as they begin their ascent back toward me. I must be a fool for even considering this. And yet I find myself climbing up onto the railing. My knees wobble and I fling out my arms to catch my balance. The rocks below seem to sharpen their teeth and the water opens its foaming mouth to receive me. I am well aware this is probably a trick on Bellator’s part, trying to get me to commit suicide, or something equally as cruel. But a small voice within urges me to jump anyways. As though she hears my inner voice, Bellator shouts, “Jump!” as the dragon soars past me. I look down again, and the small voice grows still quieter. I’m not an imbecile. And yet I long to be able to jump like that. To feel like I am flying for even a brief moment. To grasp that kind of freedom. The thought exhilarates me. Besides, Bellator was right. There are things worse than death, and serving Zeldek is one of them. I take a deep breath and let myself fall forward. Azaria M. J. Durant is a young, passionate writer of fantasy with plans to branch out into sci-fi and dystopian. 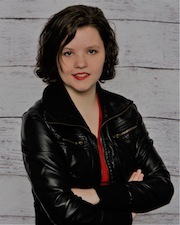 She enjoys writing stories with action, adventure, unexpected plot twists, and fleshed out characters that challenge gender roles and expectations. Azaria lives in Atlantic Canada with her family, cats, and dogs, and her big dreams to travel the world. In the moments when she isn’t writing, she is sketching concept art for her stories, participating in community theatre, or curled up with a good book and a bag of mint chocolates.